Free GRW content - even if you don't own the season pass! | Mods Forums - Mods for Far Cry, MGS & more! Free GRW content - even if you don't own the season pass! While in the game be sure to go to the pause menu and click on "Ubisoft Club". While in that menu select "Rewards" from the right hand side. There are several costumes and items you may be able to unlock for free depending on whether you own previous Ubisoft Games. For example I was able to unlock the Assassin's Creed costume merely because I already own AC IV Black Flag. 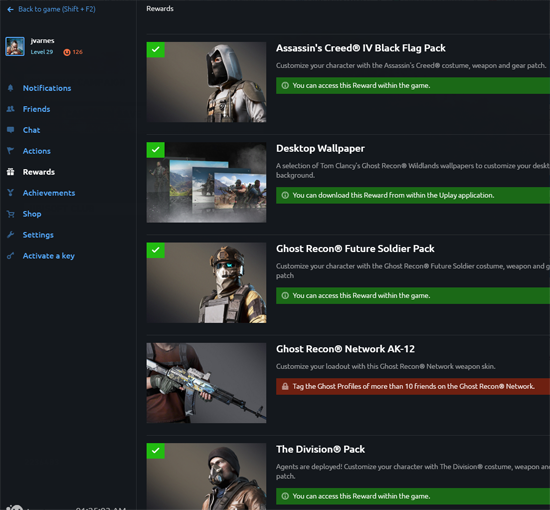 I was also able to unlock the Ghost Recon outfit and Division outfit (even though I only participated in the beta of that game) and a few other items all for free including the mini-DLC mission "Unidad Conspiracy". Note I do NOT yet own the season pass so all of these were rewards for previous game play or participation in previous Ubisoft betas and events. Meh! It would be nice if they came out with some real military type kit you can customize to outfit your character instead of this canned crap. I'm holding out for a Village People pack.......................DIBS on the Indian Outfit!